This entry was posted in Boba Fett, Cool, Picture, Poster, Sitzman, Star Wars by Ryan. Bookmark the permalink. That looks awesome! I'd go see that in a heartbeat. Who does it say is on the cast and crew at the bottom? It's not too clear on my end. Maybe I just need to go to the eye doctor. Hmm, good question. I can only make out some of the names. I see that it's starring Oola, Bossk, and IG-88, along with Dengar and a few others. Also with Salacious B. Crumb and Jabba the Hutt. 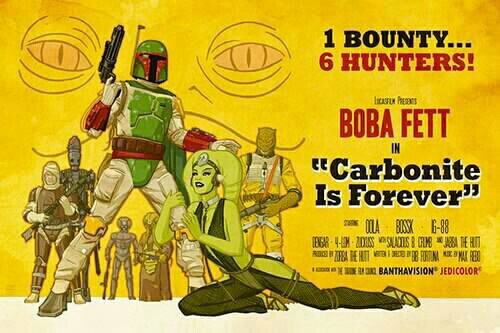 Produced by Zorba the Hutt, and written and directed by Bib Fortuna. Music by Max Rebo. In association with the Tattoine Film Council, and apparently filmed in Banthavision with Jedicolor. Good stuff!